There is nothing to beat a casserole on a cold autumn or winter’s evening. Easy and quick to prepare and which largely look after themselves until you are ready to eat it – what could be better for a warming mid-week supper? Spanish Casserole is a rich, deep red, spicy hotpot which is wonderful when coming in from the cold and can be eaten merely with warm crusty bread or with something fresh and plain such as green beans and mashed potato. The main ingredient which gives the dish its name and flavour Chorizo. Chorizo is a spicy Spanish smoked sausage and can be bought in various forms from any good supermarket. It comes pre-sliced in packs, but for this recipe, try to select a length of a large sausage from the delicatessen or cooked meats counter and then chop it at home yourself. Made with pork, Chorizo can come in varying strengths as a mix of pimento, cayenne and possibly other hot peppers are added to create the spice. If you don’t like your casserole to be too spicy, then you can always use half the quantities and substitute the other half with a milder smoked sausage such as the Polish kabanos sausage. Kabanos sausages are smaller, longer sausages and you would probably need to buy two or three. In the large pan, first gently cook the onion in a little butter and oil and then as it softens, add the garlic. While the onion and garlic base is cooking, cut the Chorizo into small cubes or bite-sized pieces and add to the pan. Add the tomato puree and stir. After this, tip in all the tomatoes and the beans. And that really is, all there is to it. All you need to do is add a good slosh of red wine for flavour, bring to the boil and then simmer for about 30 minutes until the liquid has reduced a little and you are left with a concentrated, intensely-flavoured stew. This easy dinner recipe also keeps and freezes well, so if you make twice the quantity in one batch, half can be stored for a future emergency meal. Left-overs are also very versatile. They can be served on toast, as a baked potato topping or as part of a tortilla wrap as a twist on re-fried beans. 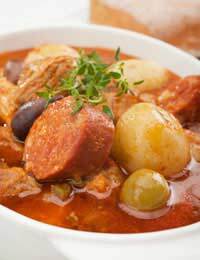 The Portuguese have a similar kind of sausage and bean hot pot every bit as delicious but which benefits from a slower cooking time. Made with a joint of gammon or ham hock it is slow-cooked with cannellini beans, garlic salami, spicy sausage and cayenne pepper. Spanish casserole is perfect for a bit of fire-side comfort but also hearty and flavoured enough to serve at an informal supper party for friends.